Chelsea Binns, assistant professor in the Department of Security, Fire and Emergency Management, has written the first book on fraud hotlines ever published. Binns, who graduated from John Jay with both her MA and PhD in Criminal Justice, is a licensed private investigator and certified fraud examiner who has extensive experience in the public and private sector. She has worked in an investigative capacity at the New York City Department of Investigation, the New York State Office of the Attorney General, Morgan Stanley, and later at Citibank as the senior vice president in fraud surveillance. She has long been fascinated by fraud hotlines, but was shocked at how little knowledge there was available on how they operate and whether they’re effective. Binns sought to fill in the gaps in that data in her new book Fraud Hotlines: Design, Performance, and Assessment, which reviews the history of fraud hotlines, how they are being used today, and how an organization can design one and evaluate its performance. The book also includes case studies that show how hotlines are used to thwart crime both in the US and in other countries. In recent years, the value of fraud hotlines has been increasingly recognized as a means to prevent major catastrophes. According to Binns, many experts believe that internal crimes contributed to the financial crisis of 2008—if those crimes had been reported via fraud hotlines, the crisis may have been prevented. It was that line of reasoning that led Congress to pass the Dodd-Frank Wall Street Reform and Consumer Protection Act in 2010, which created monetary incentives for employees to report internal crimes directly to the Department of Justice or the Securities and Exchange Committee. “The Dodd-Frank legislation shows that people are using hotlines, and they are valued as a source for tips,” said Binns. Interest in Binns’ research is far-reaching, and has drawn international interest. 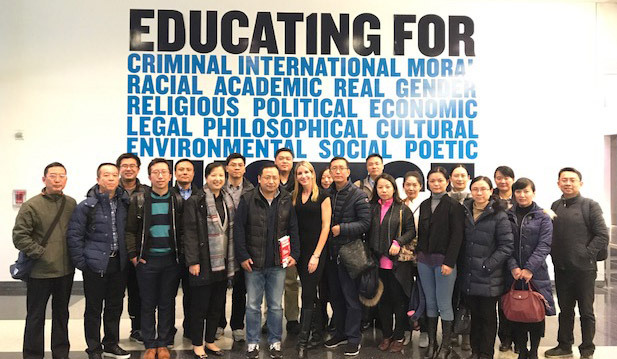 This November, a delegation of prosecutors from Shanghai traveled to John Jay to listen to Binns lecture on the findings of her book. This is the fifth delegation Binns has received from China. Delegation leader Xiao Kai, Director in the Financial & IP Crimes Department of Shanghai People&rsquo;s Procuratorate, is pictured next to Binns. Binns, who also serves on the board of the New York Chapter of the Association of Certified Fraud Examiners (NYCFE), organizes the annual NYCFE Conference that brings together national and local leaders in fraud detection and deterrence. With 80,000 members, the ACFE is the largest anti-fraud organization in the world. Since Binns first brought the NYCFE Conference to John Jay’s campus four years ago, students have served on the conference’s planning committee and 200 have been able to attend free of charge.